I have an unnatural love for Castlevania. I loved classic ‘vania growing up, spending many an hour playing through the first Castlevania games on the NES (yes, even Simon’s Quest), before moving off to play Super Castlevania 4 on the SNES, the single Castlevania game to be released on the Mega Drive /Genesis and later, through the magic of emulation, the TurboGrafx’s Dracula X. My love for the series was doubly cemented by “Iga” games, directed by Koji Igarashi. Symphony of the Night for the PlayStation 1 (and later, other platforms, including the Xbox 360!) is still one of my favourite games, and I’ve gone on to play most of the rest of the games made in its template; Aria of Sorrow, Circle of the Moon, Dawn of Sorrow, Portrait of Ruin, Order of Ecclessia and a great many other needlessly long titles. The point is, I love Igarashi’s Castevania games. He’s been credited with helping create the “MetroidVania” genre of games that have you backtracking through giant castles, gaining new abilities, and fighting great big tricky monsters. I am, as you’d imagine, deliriously happy that Igarashi is making a Castlevania successor. 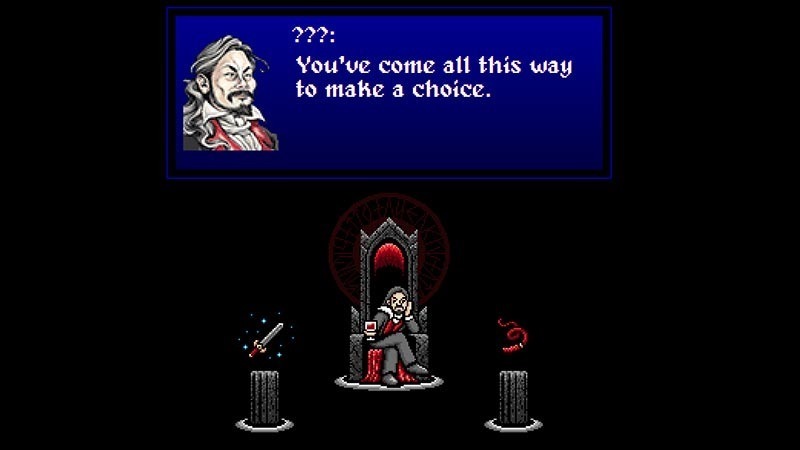 He’s no longer at Konami and can therefore no longer make Castlevania games – but I imagine whatever he has planned with thematically, aesthetically and functionally be just like those games I adore. News of his game came through a simple teaser site, which asks a simple question: sword or whip? In semi-related news, we found out today that Alessandro has never played a Castlevania game in his life.